Hockey champions Caroline Ouellette and Julie Chu were once rivals on ice, and now they’re mothers to little Liv Chu-Ouellette. No matter how dark the world may feel, at times conflict leads to a perfect resolution of love. HuffPost reports that Oullette faced off against Chu in several games, including the 2002 Winter Olympics, as the captain of the Canadian women’s hockey team. Chu served as captain of the U.S. women’s team from 2011-2013. They even wore the same number—Lucky 13—when they played against one another. And now they have a sweet babe. This is the news we need right now. 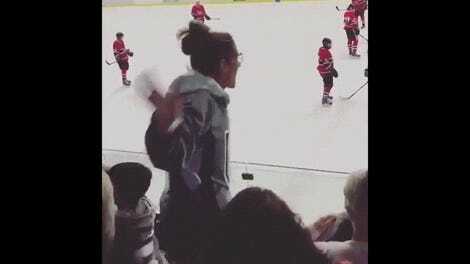 Both women currently play for the Canadian Women’s Hockey League, though Chu is on the extended roster, as she also the head coach at Concordia University. Oullette recently took a leave of absence, and I think we can see why. There are few sports stories that I truly find inspirational enough to wish for an adapted film, but this is one. Two Olympians proving that crossing sticks is tinder for the flame of love, triumphing over adversity, and making a new generation of tiny athletes!